The Skinny: The sequel to Yesteryou Yesterme Yesterday proves to be affecting and nearly as good as the original. The whole gang (minus Fung Bo-Bo) from Yesteryou Yesterme Yesterday is back, and apparently Bo (John Tang) hasn’t grown up entirely. This time out, he’s preparing to enter college, but not before his final year of high school yields life lessons of the bittersweet kind. 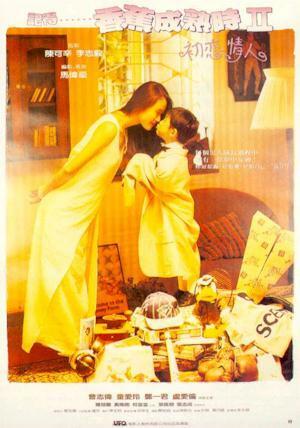 Sometime between Yesteryou and Rainbow, Bo managed to get together with Ting Ting (Ellen Lo), but the two find themselves at odds as they have to attend different schools. Being the youth that he is, Bo’s attention wanders to a nineteen year-old HK University student (Eileen Tung). She returns the interest and their developing relationship makes for some fine moments handled by the king of “Feel 100%” himself, Joe Ma. The inevitable conflict occurs where Bo must weigh his love for Ting Ting versus his newfound attraction, but the resolution and reality prove to be a painful lesson. Meanwhile, best pal Mo (Wong Wai-Nam) suffers from his parents’ divorce. He ends up moving in with Bo, leading to all sorts of friendship issues and Bo’s gnawing fear that Mo may be homosexual. All this and more problems with dad (Eric Tsang).